You will earn 6,614 Reward Points. Earn 1 reward point for every 1 dollar spent. 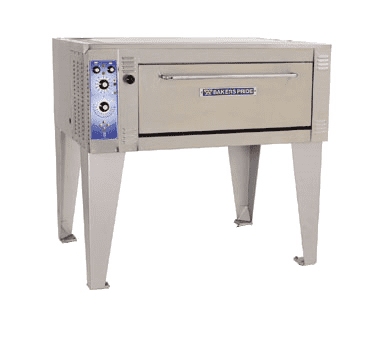 BAKERS PRIDE EP-EB-ER Series Electric Deck Ovens are designed for high volume pizza, baking, roasting and all-purpose operations. Interior decks are 36” (915mm) deep and 38” (965mm) wide. Overall dimensions are 43” (1092mm) deep by 55” (1397mm) wide. Ovens may be stacked three high. Similar footprints may be mixed with different deck heights. Oven exteriors are all heavy-gauge, type 403 stainless steel and are fully insulated up to 5” (127mm) thick for cooler outer temperatures and consistent interior temperatures. Over interiors are manufactured of high-heat resistant 18-gauge aluminized steel. Doors are fully insulated, spring balanced with tubular steel handles. All models feature independent, operator controlled infinite top & bottom heat for perfectly balanced results. Temperature ready indicator lights, moisture control damper and oven interior lights are standard. EP (pizza) series feature a 200°-800° F (149°-427°C) thermostat, 7” (178mm) interior deck height with hearth stone decks (steel decks optional). EB (bake) and ER (roast) models feature 150°-550°F (65°-288°C) thermostat, a 60-minute electric timer with continuous ring audible alarm and manual shut-off. Interior deck heights are 8" (203mm) or 12" (305mm). Steel deck standard (hearth stone decks optional). ER (roast) models feature 150°-550°F (65°-288°C) thermostats, a 60-minute timer with continuous ring audible alarm and manual shut-off (five hour timer optional). Interior deck heights are 12" (305mm). Steel decks standard. Optional hearth stone decks reduce deck height by 1" (25mm). 3836 Models are 8KW and feature 8 electric elements (4 top and 4 bottom). Voltages are available in 208v, 220-240v or 440-480v 1Ø or 3Ø as well as 230-400v in 3Ø with neutral. 2 Year limited part and labor warranty standard. ER-1-12-3836 pizza oven is ideal for high-volume restaurants, offering the same durability and performance as our gas deck ovens but with the low maintenance of an electrical system. The single oven chamber has one steel deck with a 12” deck height. The independently controlled, U-shaped heating elements on top and bottom allow for uniform temperatures and perfectly balanced baking. This model is constructed with heavy-duty, .25" angle iron frame, which is fully welded to allow for stacking up to three ovens to increase production without sacrificing space. Other options are available to accommodate the configuration of your kitchen, such as side-mounted controls and special-height legs.